The world of many two-year-olds and far too many business leaders seems to be dominated by one word: “MINE.” Like the seagulls in the old Disney movie, Finding Nemo, everything within reach is a potential casualty for the chanters of “MINE, MINE, MINE.” Their business model seems to work: kids get what they want much of the time, the birds get fed, and business leaders get their way. But none of these creatures are who we should look to for real leadership and innovation. Innovation and real success in business requires attention to one’s ecosystem, the network of partners and other players that participate in your business. If you neglect these relationships or abuse them, you can destroy the willingness of these partners to help you succeed or to share valuable knowledge and ideas that can be essential to innovation. Selfishness and business narcissism are ultimately self-defeating. Healthy business requires a healthy ecosystems with partners who trust you and are motivated to help you succeed. Squeezing every last penny out of your partners and suppliers doesn’t do that. Treating suppliers as economic enemies – treating any partner as an economic enemy, including one’s own employees – is a short-sighted approach that can reap economic benefits for a time while casting a magic spell of doom over one’s future. The blinders imposed by greed and selfishness makes sufferers of these ailments miss the rich opportunities that can be created by win/win attitudes and a generous heart. Further, it makes would-be leaders far less likely to actually lead and influence others, and more likely to create enemies and opposition. Scientific data supports an important conclusion that is counter-intuitive to the practitioners or greed: generosity and kindness create success. Those who refrain from the mantra of “MINE, MINE” and think of the well-being of others are not only more likely to have economic success, but also to gain credibility and success as leaders. This is borne out by significant bodies of data, as discussed by Arthur C. Brooks, President of the American Enterprise Institute, in his recent speech, “Why Giving Matters.” I consider this a must-read article. Brooks discusses the surprising results born out by extensive data showing that the act of giving, whether it be charitable donations, volunteering time, or even giving blood, leads to increased economic success. Part of the reason is that this more selfless approach makes a person happier, and happier people do better in work, in managing relationships, and in many aspects of productivity. People who give also gain respect and credibility from others, which enhances their ability to lead and inspire. I would add that people who are willing to help others and be kind are more likely to not ignore the needs of partners, more likely to not alienate them by being oppressive and greedy, and more likely to stimulate cooperation and the sharing of ideas. If you care about innovation and business success, look to yourself first. Do you care about others? Understand and respect their needs? Do you give to charity? Do you inspire trust and respect through your integrity and character? If not, your iron-clad contracts and Draconian negotiating skills will be like cursed relics from a bad mummy movie that only drag you down to a dusty doom. As the world becomes more “green conscious,” green innovation will increasingly be an area where the best of human creativity can surprise and delight us. One of my favorite case studies in Conquering Innovation Fatigue is that of Orion Energy Systems (NASDAQ: OESX), where CEO Neal Verfuerth’s personal journey of innovation has resulted in a large company that can dramatically cut the power bills of large and small companies with massively innovative lighting systems and a retrofitting approach that recycles everything. Green capitalism at its best! Green innovation extends to many other areas. One intriguing example from the Netherlands is GreenGraffiti®, a sustainable advertising and communication method that involves simply power washing a sidewalk or other dirty surface using a template that results in a “clean green” message standing out from the normal untreated background. Better than paint, posters, neon, or billboards, this form of communication doesn’t require removal or cleanup and doesn’t harm the environment unless you want to nit-pick about the small amount of water and electricity used to create the message, and the template itself). One of the clients of Innovationedge has a remarkable green innovation for the paper industry. 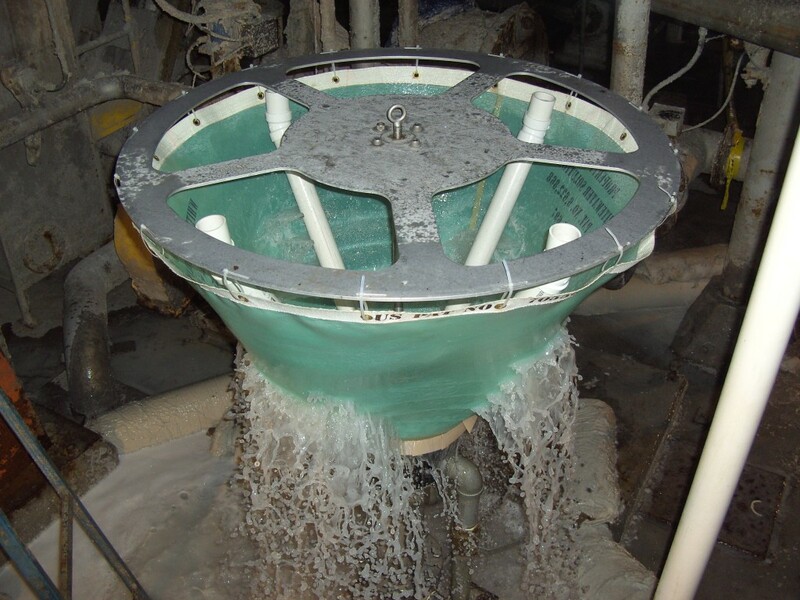 The Fractionating Saveall™ by a Wisconsin inventor is a remarkable device that helps papermakers, especially tissue makers, recover good fibers from waste streams and improve the quality of the water (“whitewater”) that is recycled in the paper machine. His clever device relies on the water flow itself to drive the rotating flexible conical screen that does the work, using no electricity or other additional power. The conical fabric screen rotates under the action of jets of water carrying fibers and “junk” (ash and “fines” – materials that are often undesirable at high concentations that can build up in a paper machine). It gathers desirable long fibers inside the screen, which roll down to a central collection area where they are sent back to the paper machine, while the water high in ash and fines but low in fiber goes outside the screen, where it can then be purified or partly sewered without losing good fiber. The flexing of the fabric screen is what gives this process so many advantages over past approaches. A metal screen can quickly plug up. But the fabric screen has a self-cleaning action due to the continual flexing back and forth as it rotates and passes under water jets that momentarily push it outward. This flexing keeps fibers from locking into place onto the screen. High efficiency, low maintenance, easy installation – really brilliant. We have a unit in Appleton that can be seen upon request, and much more info is available upon request. Green, clean, and lean – perfect for a paper machine. Naturally, a tool like this can find applications in other fields as well. Separation of solids from water is important in the food processing industry, in mining, in biomass conversion, in water purification, in waste treatment, and in many other areas. The mesh of the screen, flow rates, system diameter, and post-processing systems can all be adapted to meet the separation objectives needed. I some cases, the presence of added surfactants, defoamers, or other agents may be helpful in optimizing performance. Contact us with your application and let’s discuss how one or more of these units could be applied to meet your needs. The story of this innovation is one that fits many of the lessons of Conquering Innovation Fatigue. We hope to share it in the near future, after this device becomes more fully known and appreciated by the industry. For more information, see the Executive Summary for the Fractionating Saveall (PDF file). As I began writing this post, my wife was in a car a thousand miles away with a brand new smart phone. I received a call on someone else’s phone informing me that my wife’s smart phone had quit working completely after following the instructions she received from tech support to fix the GPS system in her phone. The GPS had quit working that morning after tech support had her do another set of procedures to fix another problem. Now she had no GPS and also couldn’t make or receive calls. The problem would later be resolved. I’m still not sure how much of it was due to network trouble (the black hole effect I describe below), hardware trouble, user error, and questionable tech support, but after almost 3 weeks of experience, I can say two things about the Palm Pre: 1) It is a terrific and beautiful phone with many innovations, and 2) Palm is doomed. Doomed, I fear, unless they make some changes in their business model and better consider the harmful long-term impact that some short-sighted decisions may have. The exciting work of the innovators within Palm may be destroyed, in the long run, by Innovation Fatigue Factor #5, “Flaws in Decision Making and Vision”(the subject of Chapter 9 in Conquering Innovation Fatigue). The problem, in a nutshell, is that Palm and Sprint (the only network for the Pre) apparently have decided to focus on getting the limited production of Palm Pres into the hands of as many users as possible, rather than letting tech support staff have them. The quality of customer service is being deliberately sacrificed to grab more market share and get more buzz among consumers, but this may backfire and create negative buzz due to some compounding factors. Some users may be happy with what they can figure out on their own and never need tech support, but I think many Palm Pre users are likely to need support. I say this because users are not given the Palm Pre manual and the manual in PDF form is not provided on the Palm Pre, cannot be downloaded from the Palm Pre, and even if loaded onto the Palm Pre, cannot be read by its PDFView application without crashing the phone. It’s a painful irony that makes aggressive users rely more than they should on tech support, and yet tech support is in the dark. When you call 888-211-4727 for support, you will be speaking with someone who has never used the phone, perhaps never even seen one. You can usually get to a human in under three or four minutes, which is wonderful, but simple questions can take far too long to be answered, if an answer ever comes. If uncorrected, this will drive consumers away from this phone and toward the many alternatives that can do many of the same things. Here’s an experience that illustrates the problem of using inexperienced tech support instead of people familiar with the phone. I had a problem with a disappearing icon. There are five icons across the bottom of the screen for a newly installed phone: one for dialing, one for contacts, one for email, one for the calendar, and one that brings up a directory of apps and services. On day two of using my phone, the email and calendar icons disappeared. I’m still not sure how. There were suddenly just 3 icons, not five. I was able to still find email by navigating through the apps, but wanted the convenience of rapid access to email that the icon provided. So how does one get it back? Nothing in the skimpy guide given to new users addressed the issue. So I called tech support. After being escalated through three levels of tech support over the course of an hour, I still hadn’t found anybody who could answer that question, so I gave up when, mercifully, the signal dropped. The top-level person didn’t call back. The next day, when I had to call again for another issue, and while talking to a rep, I asked this new guy if he knew the answer to the icon puzzle. He put me on hold for about 60 seconds, and then came back with the simple solution: press any icon in the apps window for several seconds until it glows, then drag it into the row of icons at the bottom of the screen and it will stick. I was delighted. “Wow, that’s great. Do you mind if I ask why you were able to help so quickly when three levels of tech support yesterday all searching for the answer couldn’t help?” “Oh,” he said, “there’s another guy over here who owns a Palm Pre. So I asked him and he was able to show me.” Ah, someone with experience – someone with a phone! Because the person I reached knew someone with experience, he was able to reach out to his local value network and get the knowledge I needed, and he could do it in 60 seconds, compared with a fruitless hour of my time and Sprint’s when talking to people without experience. My wife and I have been contacting tech support a lot– far too much, but usually out of necessity–and nearly everyone I’ve talked with didn’t know much about the phone at all. Thank goodness one person had access to someone who had one. By going for short-term market share by getting more sets into the hands of the public instead of into the hands of your own support staff, Palm is taking a huge risk and incurring costs that may well outweigh the benefits of the accelerate distribution to the public. Among the many barriers that we inventors, entrepreneurs and would-be innovators face is the one we can’t blame on others. 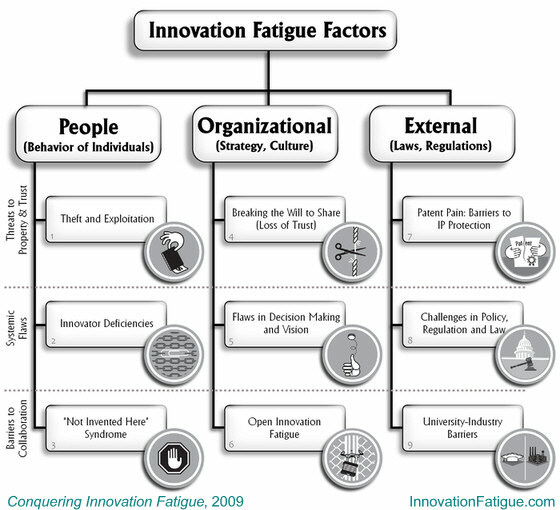 Fatigue Factor #2 in our grid of fatigue factors is innovator deficiencies. It refers to the barriers we create for ourselves through excessive pride, unreasonably high valuation of the invention, arrogance, unwillingness to share or collaborate, stubbornness, unwillingness to delegate or gain the help of experts, and a host of other personal weaknesses. So many good ideas are killed by these personal flaws. They are painful to admit and recognize, but an awareness of our own weaknesses is not only the beginning of wisdom, it’s the beginning of innovation success. The icon for this fatigue factor was designed by Mark Benyo, an artist in Appleton, Wisconsin (owner of Benyo Designs). It depicts a long chain (wrapping back and forth across the window of the icon) in which one of the links is replaced with a paperclip. The individual innovator/inventor in this case is the weak link in the cain of innovation. Unless that link is strengthened (perhaps with the help of strong allies or experienced guides), failure is likely. We offer more detail in the book, of course, and outline some steps that can be taken. Prospective innovators, take note. Look to yourself first to understand why your innovation goals are not being reached, and then find the right help to take you to the next level. One of the most common innovator deficiencies involves excessive pride, which translates into unreasonable expectations regarding the value of an early-stage invention or concept. Valuation of inventions is always difficult. However, if you think your embryonic invention is worth many millions or even billions, chances are you’re way out of line at this point. An idea alone usually has very little marketable value. An idea converted into working prototypes and a valid patent has more value, but the real value comes only by addressing the many risks that potential licensees or acquirers face. Can it be produced economically? Is it safe? Does it meet unmet needs? Can it be marketed successfully? Will it sell in the marketplace? Can it withstand the competitive response? These risk factors take time and money to address. The idea may ultimately be worth billions, but no one is going to hand you a truck load of money for something that is just a twinkle in your eye and maybe a piece of government paper on your wall. Not yet. It will take time, diligence, and investment for the potential to be discovered. Until then, have reasonable expectations as you collaborate to bring your concept to the market place, so that ultimately you can enjoy a cut of the potential returns your innovation can bring. Erratum in the book: An unfortunate but minor error in the printed book is that the icon for innovator deficiencies (shown at the left) is not at the beginning of the chapter on Fatigue Factor #2, as it should be. Instead the icon shown there is the one for Factor #5, “Flaws in Judgment and Decision Making.” Sorry about that! The icons in the fatigue factor grids are correctly displayed. There are nine main “innovation fatigue factors” that we discuss in the book. They are summarized in the grid shown below (click to enlarge). Nine of the twenty-four chapters of the book deal specifically with these. 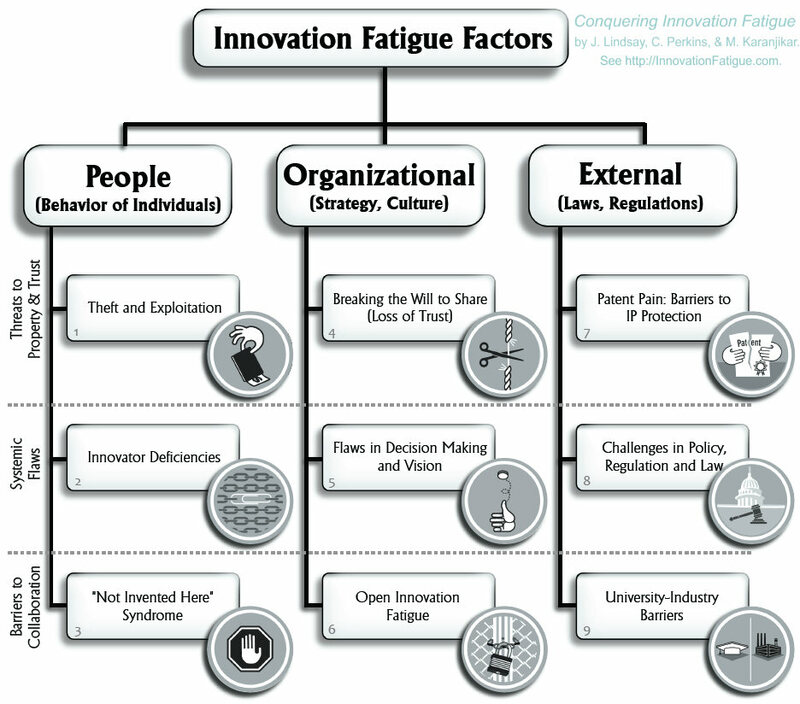 Innovation fatigue can come from three primary sources: interpersonal factors (“people fatigue”), organizational factors, and external factors such as laws, regulations, and tax policies. These three sources of fatigue factors correspond to the three columns of the grid. Each of the three rows have some commonalities as well. The top row corresponds to fatigue factors due to loss of trust and challenges to rights (IP rights). The middle row deals with systemic flaws (inventor deficiencies, organizational flaws in judgment and decision making, and challenges in public policy and law). The bottom row involves barriers to collaboration, including the “Not Invented Here” syndrome that can hinder collaboration within a company or university – often an expression of personal pride or arrogance, plus organizational barriers to open innovation and the external factors (among others) that hinder collaboration between industry and universities (or national labs and other non-profit organizations). The Grid of Nine Leading Innovation Fatigue Factors. Where should a company start? Fatigue factor #4, “Breaking the Will to Share,” is one of the most insidious and difficult to detect using normal organizational metrics. It’s easy to detect if you understand it and look for it. This silent innovation killer can devastate innovation even when companies feel they are firing on all cylinders when it comes to innovation. If you only have time to read one chapter in the book, the one on “Breaking the Will to Share” may be the place to start.